- Measures Width: 270 cm Depth: 093 cm Height: 256 cm Weight: 1300 kg - 2 years Guarantee! - Free Shipping! 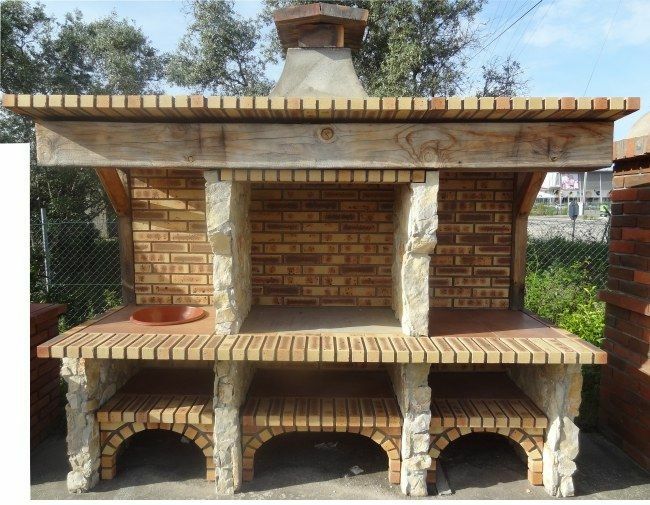 Mediterranean Brick Barbecue FR0085F Free shipping to England, metropolitan France*, Monaco, Belgium, Luxembourg, Italy and Spain. For other destinations pleasecontact us. 1. Thinly slice the aubergines lengthways, discarding the outside slices. Arrange on a large baking tray and sprinkle with salt. Leave for 20 mins – this removes any bitter juices. 2. Rinse the aubergine slices and pat dry with kitchen paper. Reserve 3 tbsp of olive oil. Toss the aubergines slices in the remaining oil and season with black pepper. 3. Grill the aubergines a few slices at a time for 3-4 mins, turning once until both sides are chargrilled and tender. Remove from the barbecue and leave to cool. 4. To serve, arrange the aubergine slices on a large platter, scatter over the pine nuts and chives, then drizzle over the remaining oil and balsamic vinegar.